↑ A. F. Cheng, A. A. Simon-Miller, H. A. Weaver, K. H. Baines, G. S. Orton, P. A. Yanamandra-Fisher, O. Mousis, E. Pantin, L. Vanzi, L. N. Fletcher, J. R. Spencer, S. A. Stern, J. T. Clarke, M. J. Mutchler, and K. S. Noll. 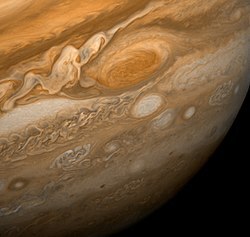 Changing Characteristics of Jupiter's Little Red Spot(անգլ.) // The Astronomical Journal, 135:2446—2452. — 2008 June.